Happy Thursday loves! This week seriously dragged for me. I think I'm so used to being in meetings and then having to play catch up that it was weird not spending 60% of my time in a meeting not being able to work on things as they came in. Either way, it's almost the weekend and I am definitely ready for it. As much as I love Florida, we're back up in the upper 80's so my fall fashion has been put on hold for the time being. Instead I've been trying to find ways to wear things with a fall "feel" but are cool enough for warm temperatures. So naturally I've been gravitating towards jewel tones, neutrals and deeper shades which is why I fell in love with this shift dress. 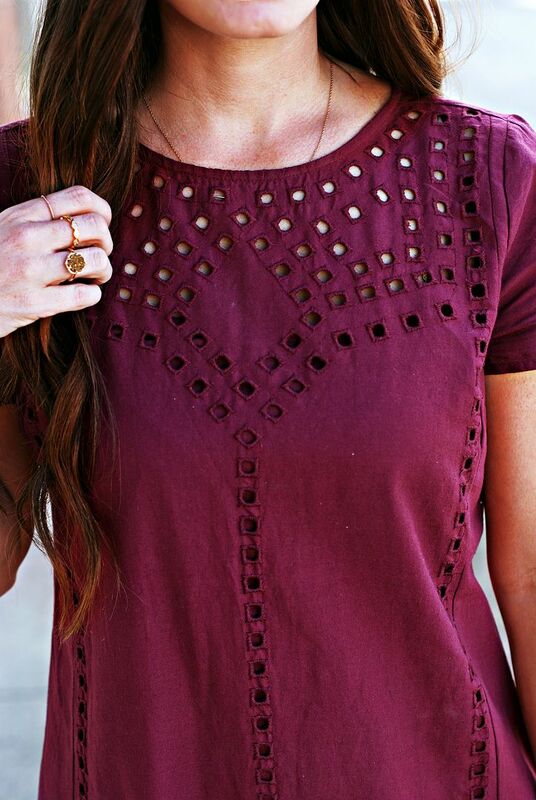 ﻿The cranberry color is perfect for fall but the short sleeves and laser cut outs still make it warm weather appropriate. I can totally see myself rocking this with booties and a jean jacket when it gets a little cooler and it's perfect for wearing in the office. I love that the laser cut out details, especially around the neckline, adds a little something extra to the look and spices it up a bit. You can show off a little skin without it being over the top. I kept my accessories pretty basic with this dress since there's already so much going on. 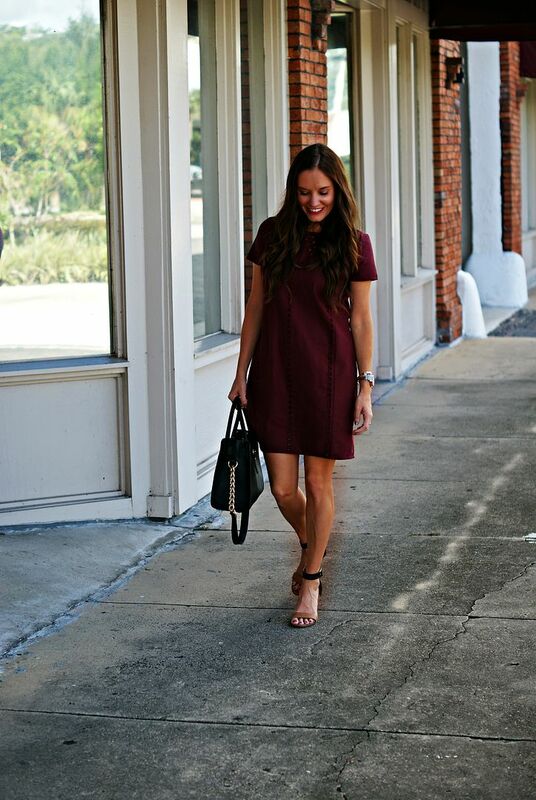 This dress is definitely the perfect little fall dress for days that feel a little more like summer than fall. You look fabulous! Cranberry has been my favorite look this season and you've nailed it! I love the detailed cutouts. Dyyyyying over your shoes!! Cranberry is my favorite color this Fall, so gorgeous! Girl, cranberry is YOUR COLOR! How cow gorgeous! Can not believe the price point on that dress! This gorgeous color definitely checks the fall box! You look lovely, lady! That color is STUNNING on you! I love the shape (and price!) of that dress, but seriously, that color! GORGEOUS color and I love the detailing, you look amazing friend. This color is beautiful on you and I love the eyelet detailing! That dress is perfection!! Perfect look for this warm fall! I love Old Navy and this color! I'm gravitating towards buying everything in this color for fall, so pretty! I love this color! The berry shade is definitely one of my favorites. I want all of the cranberry items right now!! This dress looks fabulous - I love the detail on it! That color is perfect on you! I just ordered a cranberry midi skirt from old navy (for $8!) that I'm loving. I may have to add this dress to the list... And girl I feel you on meetings! I had a 4 hour one the other day! How can you get anything done?! This definitely looks like "fall" while still being cool enough for 80 degree temps!! Love your sandals! So pretty!! I'm loving the burgundy on you! The cute eyelet detailing is so fun! I just love the details on your dress!! Cranberry is definitely my favorite color right now. Ok, I love this dress!! I think a trip to Old Navy is on the list for me today to find this pretty!! Would you say this dress runs true to size? LOVE! That color looks fabulous on you. Sorry for being MIA lately. Miss ya, lady! You look stunning, my friend! That is such a fantastic color on you. And, Old Navy?! They seriously have been killing it lately. Love the dress! And it is absolutely the perfect color for fall! GIrl that color looks amazing on you!!!!! And you know what else looks amazing? Your hair in this picture!!!! I am having the same problem with it being too warm to wear jeans, boots and cute sweaters and too deep in to fall to be wearing my flip flops and bright colors lol. Such struggles we have in the south, right??? Well regardless, you are doing it right! Cranberry is gorgeous on you! Perfect for fall! I'm loving this color lately. Like everybody else but it's just so pretty and looks great on you of course! This week IS dragging! I love this color though and it looks amazing on you! Such a cute dress, I love the color! So pretty! Love this color, and really all of the jewel tones right now! i LOVE this colour so much!! Looks so good on you! stop. this dress is PERFECT and i need it in my life. 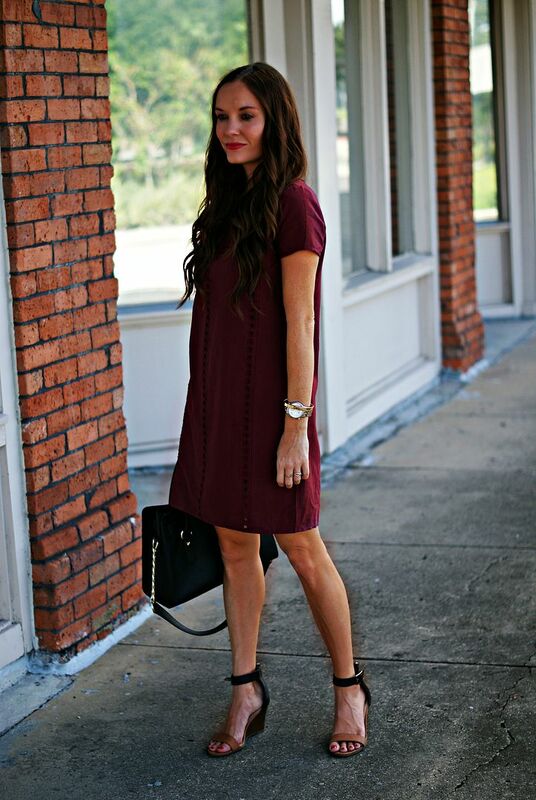 This cranberry dress looks SO good on you! I love this dress, it looks so good! I'm gonna have to get it, especially for that price.